The people behind the television adaptation of The Walking Dead comic book are now working on Chew: A story about a psychic food detective. Production company Circle of Confusion, which will be bringing the awesome Walking Dead zombie comic series to television in October, has another cult-hit comic in its sights. Deadline reports that the company plans to make Chew into a tv series, a comic about a cibopath detective named Tony Chu. Never heard of a cibopath before? A cibopath is someone that gets a psychic impression from anything he/she eats (except for beets, in Tony's case). If a man was murdered and fell into a watermelon, Tony would be able to catch the murderer by taking a big refreshing bite. Unfortunately, his bosses often ask him to eat the remaining pieces of victims too; a somewhat less appetizing task. The book also involves a strange ban on chicken due to a supposed bird flu, with Tony enforcing the ban at the FDA. It's unique and worth reading to say the least. 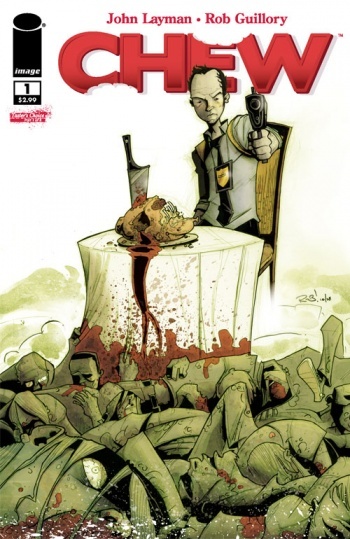 Chew, written by John Layman with art by Rob Guillory, became an unexpected hit after a teaser debuted the series in an issue of The Walking Dead. The first issue sold out through multiple reprints last year. Layman is happy for his first major successful book, saying: "It only took 15 years." I thought it was incredible to see The Walking Dead make it to television, and lesser known but well-written comics like Chew following in its lead is just a bonus. There are some great stories being told in the world of comics that don't get their due. The Chew deal appears to be in its infancy, so we'll have to wait to hear more as it gets worked out.